It may come as a surprise, but we are not big shoppers. In fact, I don’t think it would be an exaggeration to say that we hate shopping. 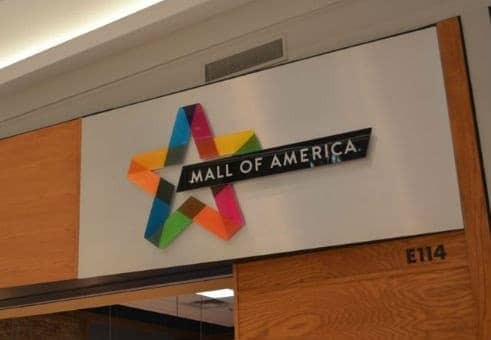 So, why would we decide to go to the Mall of America? The truth is – with family in the burbs, the airport just minutes away, and frequent light rail trains to downtown Minneapolis – the hotels that flank Mall of America (MOA) make a prefect base station when we’re visiting the Twin Cities. So, despite being guys who need therapy after a day of “retail therapy,” we could only stare at the massive MOA structure from our hotel window for so long. We needed to make the short journey across the parking lot to conquer one of the world’s largest shopping and entertainment complexes. Even we know that shopping on this level takes an extraordinary amount of fuel; a coffee and power bar wouldn’t cut it. We needed stamina, so we decided to start with happy hour at one of the mall’s outlets. With numerous restaurants from which to choose, selecting a place to fuel up nearly took us down. Only minutes into our MOA experience, the sheer scope of things was already taking its toll. Review sites were helpful; surprisingly, the goliath-sized shopping complex was chock-full of well-reviewed restaurants. The decision was made when we read that Twin City Grill was known for comfort food and cocktails. Several delicious flatbreads, dips, and MOA-sized Old Fashioned cocktails later, we felt as prepared as ever to tackle the four-story mega mall. We decided to warm into things by starting with the familiar – the Apple Store. A quick look at the map showed the shortest distance between us and shiny, techy goodness required us to navigate Nickelodeon Universe, a 292,000-square-foot amusement park in the center of the mall. Let me repeat that in all caps: A 292,000-SQUARE-FOOT AMUSEMENT PARK IN THE CENTER OF THE MALL. Dora the Explorer, Jimmy Neutron, and Spongebob Squarepants would not deter us. We hustled past the Splat-O-Sphere and the Log Chute to the other side. But just when we thought we were free and clear: Lego Land. Statues created by Master Lego Builders (yes, that is a real title) stopped us in our tracks. The tubs of thousands of small colorful building blocks called us. Perhaps we had already met our match. One of us suggested that we spend the rest of the day playing with Legos; the other knew that we must keep going. We moved on. We breezed through the Apple Store (if you know us then you know that is a lie) and made fairly quick work of the first floor. We took a pit stop in the MOA store to check out mall swag. Yes, mall swag (that’s a thing). We were feeling pretty good about ourselves when we started on the second floor, and we noted something strange. “Didn’t we just pass an American Eagle store?,” one of us asked. “I think we’re already lost.” We scanned the directory to find out that there are two. Of course there are. Viewfinder Tip: Many MOA retail outlets have multiple locations. Use the directory! Rounding out the second floor, we encountered our biggest hurdle yet. How had we missed the cast of Days of Our Lives signing books in the atrium? Had we looked right past the hoards of fans waiting patiently? Despite not having watched “Days” since boring summer vacations, we propped ourselves against the railing and took the whole thing in from the second story vantage. After several hours, we made it to the third floor. Having burned off our happy hour snacks and cocktails, we stopped to get a bag of mini chocolate chip cookies. Knowing that the fourth floor was largely a cinema and bowling alley, we felt like we had earned the sweets. We’d almost made it! Undeterred by the I Love Minnesota store and having worked through the fear of delirium brought on by passing a third (or fourth?) Lids, we made a full loop of the third floor. We were feeling pretty darned proud of ourselves. That is until we made a shocking realization; we’d completely ignored the gargantuan anchor stores – Macy’s, Nordstrom, and Sears. We also hadn’t stepped foot in the attached Radisson Blu Hotel. Had we done enough? Then we had a critical revelation. We needed to save something for next time, because we would totally be back. What are some of your favorite shopping experiences around the world?